Today's Draw: Nine of Swords in the Action position from the Hello Kitty tarot and the Deck of 1000 Spreads. Are you afraid of making a change? Are you waiting for your fear to subside before you do that? Or are you maybe trying to gain control of your fear first? 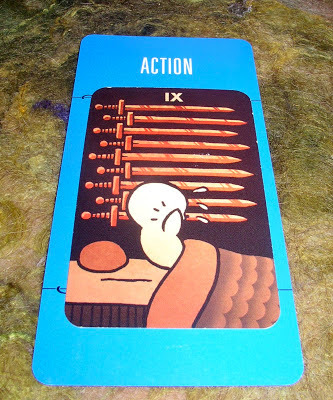 The Nine of Swords, adorable as it is in this deck, is a card about worries, fears and nightmares...the kinds of things that keep you awake at night. And yet today, we have it in the "Action" position, meaning it's what the tarot recommends we do. Well, this all ties together perfectly with yesterday's reading. Yesterday we talked about having the courage to let go of one rope so you can grab another—to commit to a new way of being without necessarily having a safety net to catch you if you fall. What today's duo comes to tell us it something that's very relevant in my life. It's telling us that we have to feel these fears and negative emotions. We're not supposed to ignore them. We're not supposed to drink them away. Or eat them away. Or deny them. Or avoid them in any other way. Sometimes I find myself putting negative emotions aside...seeing the bright side or explaining things away. Or I might be sad and turn on the TV to distract me. Or maybe I'll start crying about something and buck myself up. There are a number of ways I know to keep from feeling feelings. I even do it with positive feelings—"ok, enough of that, let's get back to business". I think a lot of this came from being made fun of as a kid. I learned to build a callous against hurt feelings. And I was a sensitive girl...dramatic. I remember my father saying, "don't cry, you look ugly when you cry." His intentions weren't to be mean. I guess he thought that logic would keep me from crying. Those are a couple of things that come to mind as to why I do this. As a society, when someone's sad we have a tendency to try to cheer them up. When someone's crying we say "don't cry". When someone's feelings are hurt, we say "don't feel that way". But the thing is, we have to. Holding negative feelings inside is toxic. And to think you can just ignore them and push them aside is a fallacy. Everything has an energy. And that energy needs to be processed. It's like peas...haha. I hated peas as a kid, so I would hide them under my potato skin. It was an excellent cover. It might fool my mom, but the peas didn't disappear. They were still under the potato skin. And the energy of our feelings doesn't go away—no matter where we hide it—until we process and transform it through our "emotional digestive system." Lately I've been indulging my emotions more. My brother's illness and death have played a large role in all of that. I remember crying some about my mother dying, but it always bothered me that I really didn't shed any tears for my father. I do, however, remember going numb. That all happened 25-30 years ago and, in between, I can see a series of either non-feeling or focusing on some feelings and ignoring others. There's a saying that courage isn't doing something with the absence of fear. It's about doing it despite your fear. So if courage is what we need to transform our lives, then we've got to be honest about it, feel the fear, mourn the past, and go forward regardless.